How do we get around? 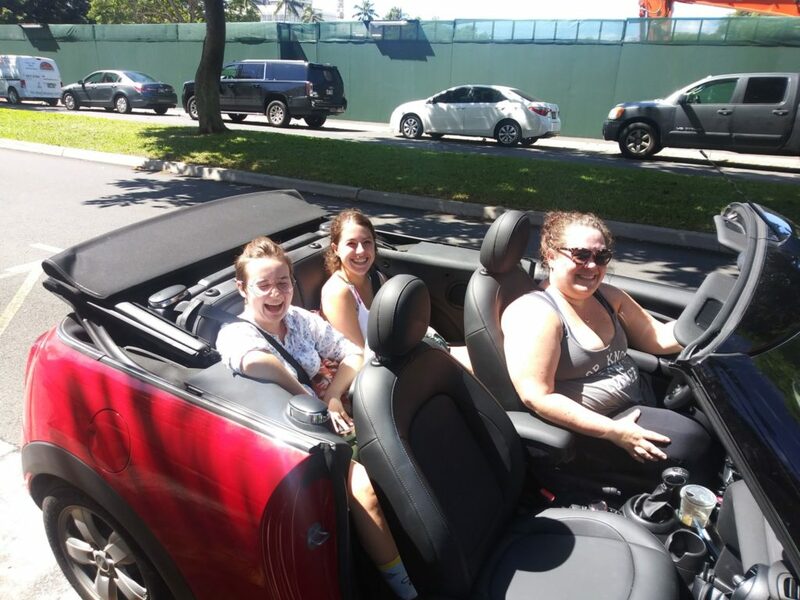 When we’re lucky, in a convertible Austin Mini Cooper, as when Wheaton’s Manager for Arts Events and Publicity Jessica Kuszaj spent several days with us – upon her arrival in the Cooper she was instantly one popular person and her rental car was one extremely popular ride. 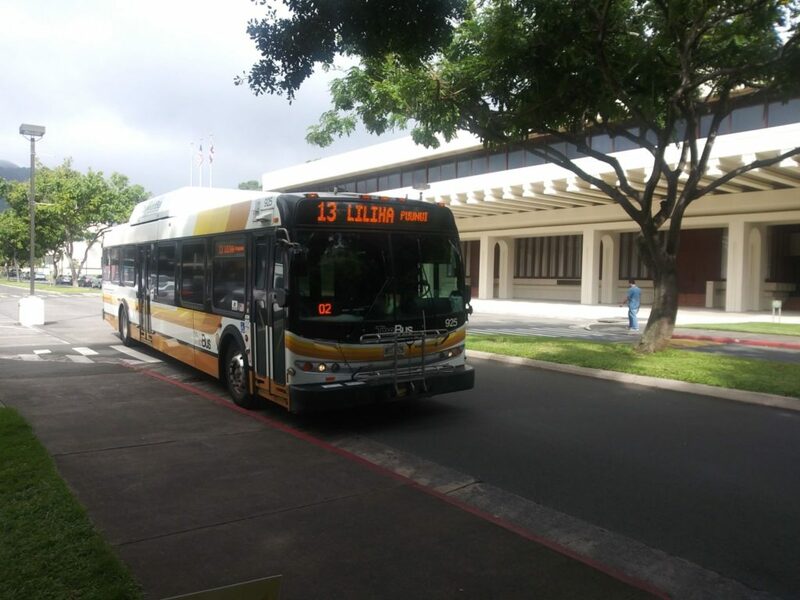 More often, we pull out our monthly passes and hop on TheBus (“DaBus”), Honolulu’s public transportation system. The Honolulu Bus has basically gotten us almost anywhere and everywhere for the last three+ months. They have a very helpful GPS setup where every stop in the system has a unique number, via which bus arrivals and departures can be searched. It’s been amazing for people of my (Prof. Allen’s) generation who back in the day spent untold hours just waiting, waiting, waiting… with no clue when the next bus would come. 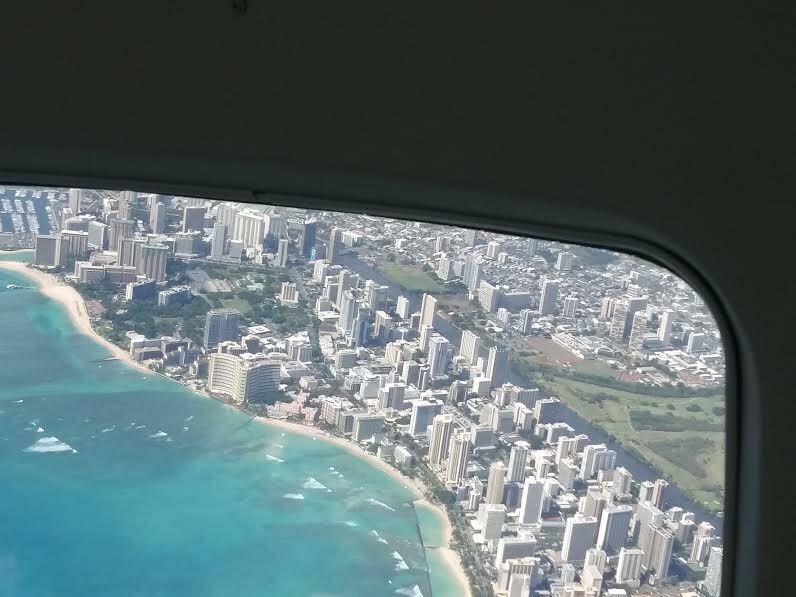 Now in Honolulu, we know within a couple of minutes and we can even key our other activities so we can arrive at a bus stop a few minutes before the bus is due. The drivers all wear aloha shirts, and most of them are extremely friendly and helpful in verifying what stop to get off to catch your connection. And the system does a really good job of accommodating wheelchair passengers as well as bicycles. 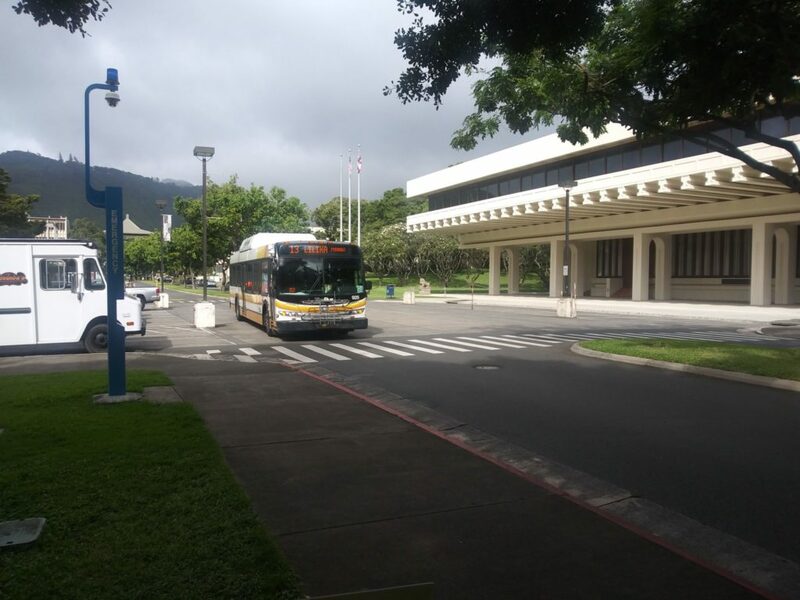 Pictured here pulling into the stop right next to Jefferson Hall is the #13 Bus, probably the one we use the most because it shoots straight down Kapahulu Avenue to Waikiki and the beach area. 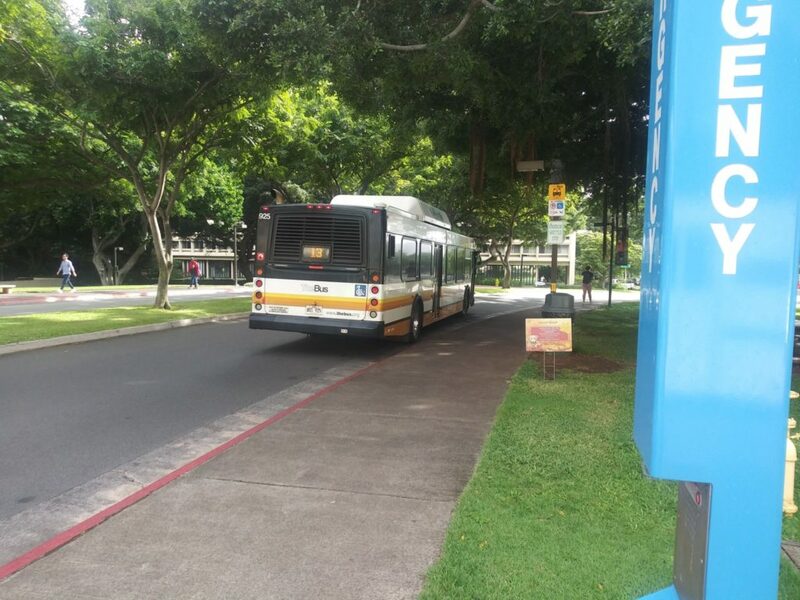 Other busses we have come to know and love include notably the “A City Express” which takes you by Ala Moana center, through downtown, through Chinatown, and out towards the airport. Reflecting on the time we’ve been here, our bus experience can help us measure where we are along our arc of experience – the first couple of weeks, the bus system felt like an absolute miracle because it enabled us to get around town independently. Successfully figuring out which bus to take gave us the feeling we had truly arrived at a cosmopolitan, sophisticated understanding of the city. Now, while DaBus is still a vital and useful part of our lives, we complain the A/C is cranked way too high, and it bothers us that potholes seem to be sprouting everywhere and getting bigger every day. Sometimes when I get on a bus, it feels like the hard plastic seats are going to crash right through the suspension (if indeed it has shock absorbers – I haven’t checked). In the Waikiki area there is a second bus system operating, one which I don’t know much about. It’s really kind of a parallel network, because it is designed for and patronized almost exclusively by Japanese tourists. As we’ve learned, the Japanese are a major tourist presence in Hawai’i. Among the reasons is that many people speak Japanese here and there are a ton of Japanese restaurants, so that Japanese generally feel very at home. We’ve often heard it said that there are many more hula halaus (schools) and dance students in Japan than in Hawai’i. These all speak to the historical links going back to the massive migration of laborers from Japan to Hawai’i in the late 19th century, and are key to understanding the attraction. 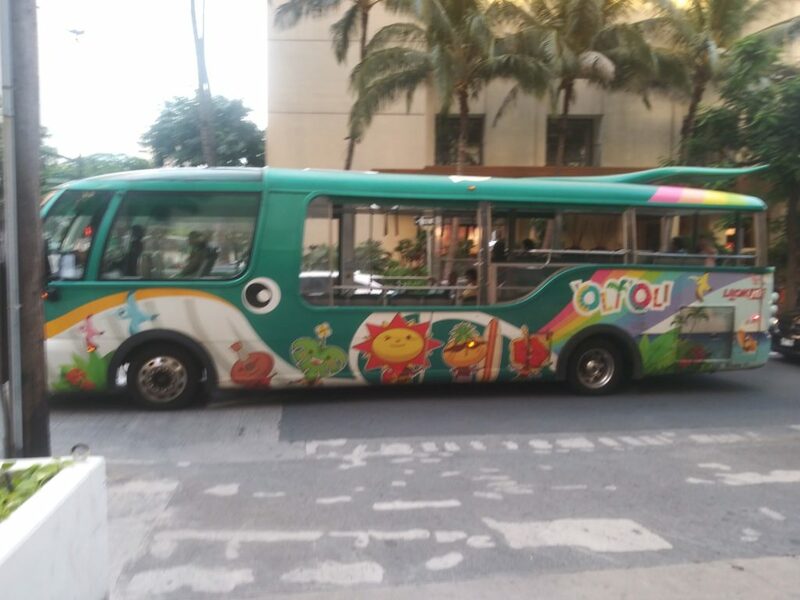 Here is one of the colorfully decorated tourist busses that patronize the Japanese clientele in Waikiki. 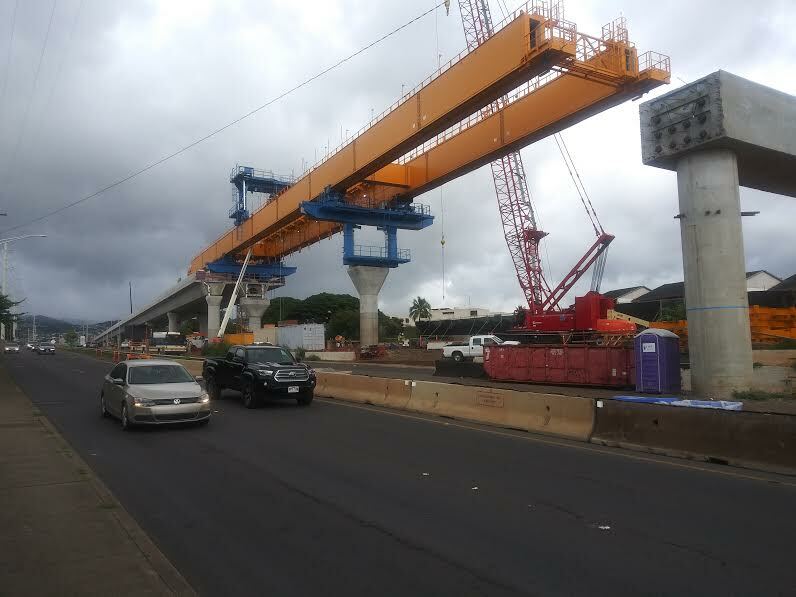 To finish this brief inventory of our wheels in Honolulu, an elevated light rail system, the “Honolulu Rail Project”, is currently in the middle of construction. When completed it is set to connect Waikiki in the east with the Airport, Pearl Harbor, and beyond to the west. There is as of yet little evidence of the project on the east side of town where we live, or in the downtown area, but last week when we visited Pearl Harbor I was fondly reminded of Boston and the Big Dig – everything is torn up, traffic is rerouted as unbelievably huge machines pour concrete and maneuver steel girders, all seemingly within extremely tight tolerances. And in the midst of various delays, funding seems in jeopardy and accusations are flying in the local press about fraudulent business practices. 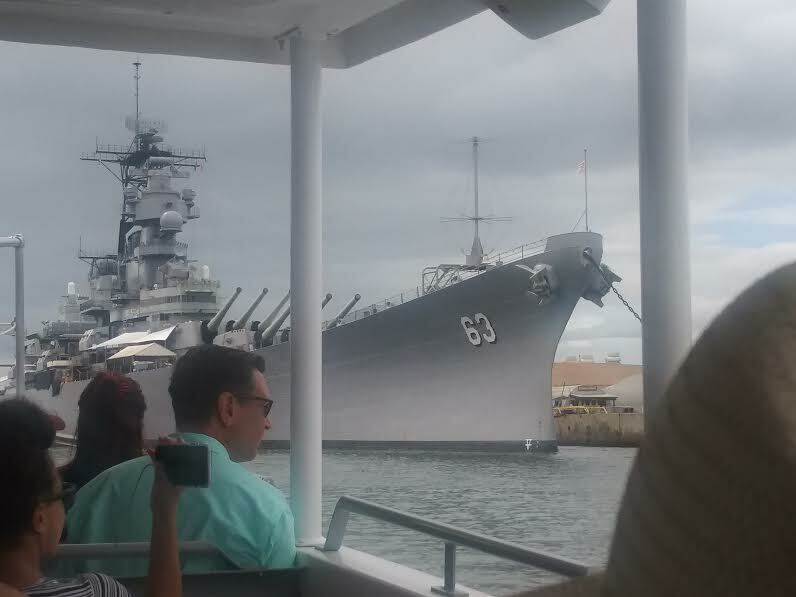 The Arizona Memorial loading dock was deteriorating to the point where it is currently being renovated and so the memorial is not open to the public; a boat tour took us out into the harbor and around the Arizona, and several short movies about the attack and the events leading up to it were available in the two very good museums on site. Some of the most powerfully affecting parts of the visit for me and students on the trip were the video testimonials of people whose lives were affected on all sides of the conflict – American soldiers; Japanese aviators; Hawaiian American citizens of Japanese ancestry some of whom would be sent to internment camps, and Honolulu residents who were panicked in the hours and days after the air attacks, not knowing what was going on. We learned that on December 6th itself, a high level Japanese negotiator was in Washington DC, at the very moment that the Japanese aircraft carriers were readying to launch their planes. The Japanese emissary himself was kept in the dark about the imminent attack by his government. A letter dated December 6th which President Roosevelt wrote to the Japanese leadership is on display, proposing terms for an agreement that would limit Japanese expansion in East Asia. Early in the morning of December 7th, American radar operators picked up a large group of aircraft flying towards Oahu island from the north; when they reported this up the chain of command, they were told it was nothing and to ignore it, because a group of American bombers were due to arrive in from California at around the same time. The US was prepared for sabotage but not for attack by air, and they did not think the Japanese had torpedoes that could operate in the shallow waters (ca. 30 feet depth) of the harbor. 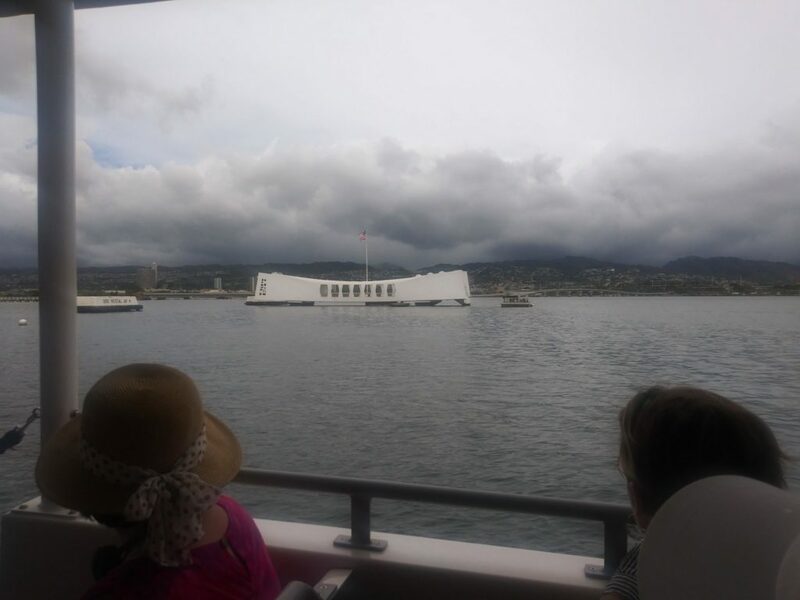 Lots of errors, mistaken analysis, and misperceptions factored into what happened on December 7, 1941. 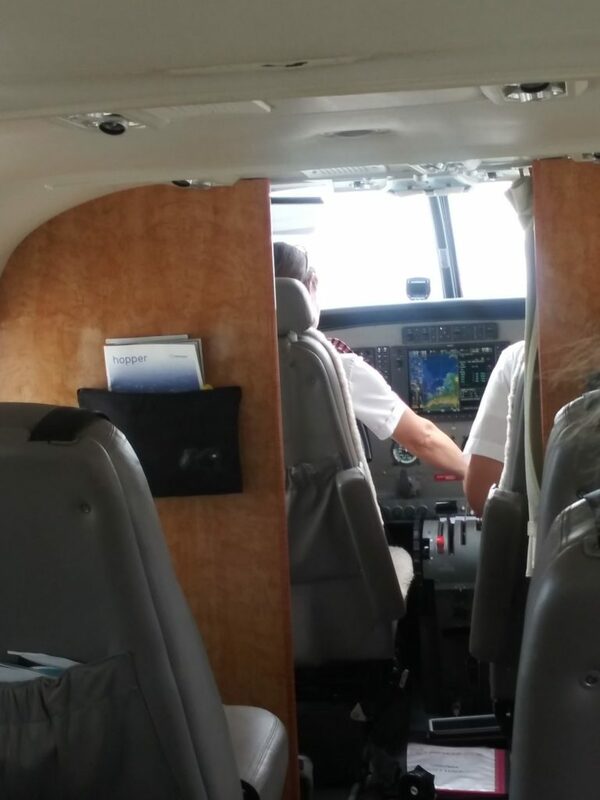 While a decade or so ago there were several inter-island airlines giving some competition to Hawaiian Airlines (such as Aloha Airlines), these days the competition appears to be limited to one small company. 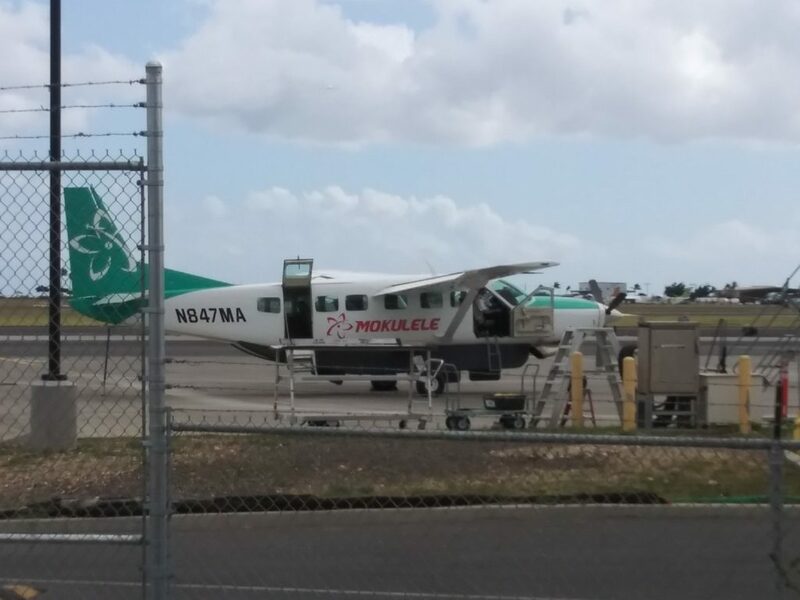 Mokulele Airlines (moku=island + lele=hopper) operates a fleet of Cessna Grand Caravan 9-seater aircraft. I wasn’t aware of the plane’s size till arriving at Terminal 3 at Honolulu Airport where we were told by smiling employees that there was no need for boarding passes, and “There’s no TSA!” Sure enough, there were no scanners, K9 dogs, or for that matter, police. The seating assignments appeared to be based on the employees’ sizing us up by height and weight. 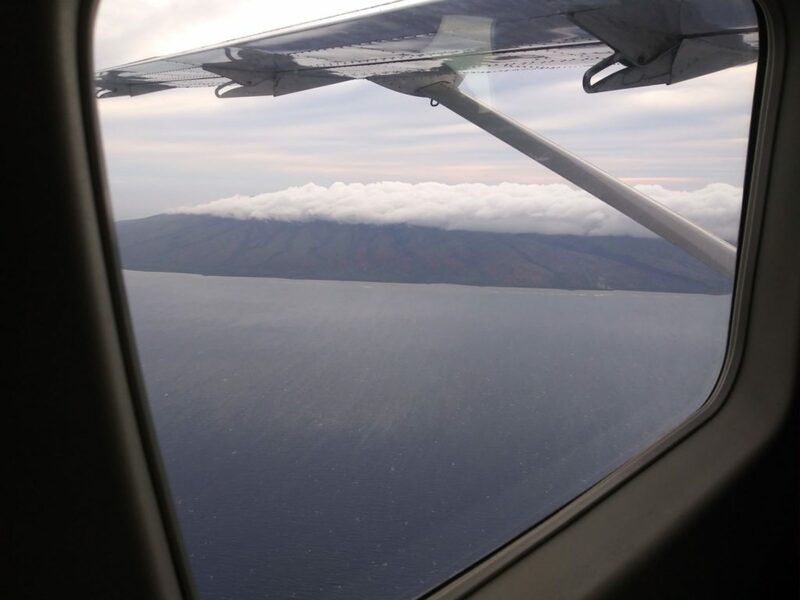 The route by air from Honolulu to Kapalua (West Maui) airport goes over the island of Moloka’i, whose northern tip is only about 30 or so miles from the south eastern end of O’ahu. The flight also gives views of the island of Lanai, for many years wholly owned by the Castle and Cooke Company, a predecessor of Dole Pineapple Corp., founded in the 19th century largely by children of the original missionary families. Lanai was almost totally planted in pineapples and became known as Pineapple Island. In a huge purchase in 2012 which unfortunately did nothing to restore Hawaiian land to Hawaiian people, Oracle Corporation CEO Larry Ellison purchased about 95% of the island of Lanai from Castle and Cooke, in a price reported in the neighborhood of $300 million US. Coming up: Details of our early December trip to Volcano National Park on the Big Island of Hawai’i.